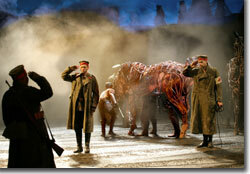 Part of our astonishment at War Horse is its epic scope, the odyssey of a boy and his horse set against World War I in Europe; part of our amazement is the spectacle of life-sized model horses imbued with every tic, snicker and snort, swish of the tail, and muscular wrinkle of the great beasts themselves; part of our awe is of the heart-rendering drama. Add these up and the experience is more than the sum of its parts: we are totally transformed. Based on the novel by Michael Morpurgo, War Horse provides a small, but palpitating glimpse into the slaughter of the Great War and its toll on humans and animals alike. All the bluster and bravado that precedes every such conflagration, the surety with which leaders and followers alike promise easy, glorious victories, is laid bare before us. The cavalry charge, the rifle reports, the canon fire, the smoke, and eventually the buzzing aircraft and an impressive tank send us reeling. Yet it is, ultimately, the simple story of a boy's love for his horse and the parallel trials they face during their separation. After raising Joey since he was a colt, Albert's world is torn asunder when his father sells the horse to the British cavalry. We've watched them grow up together, the wood-frame colt, awkward and buoyant, the flesh and bones boy, patient and kind, their symbiosis palpable. 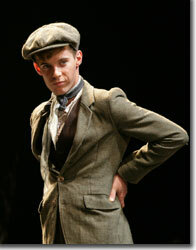 Luke Treadaway encapsulates both the boyish wonder and caring of Albert, as he raises Joey and grows up along side him, and the heroic and stoic aspects of Albert, as he pursues Joey into the theatre of war. 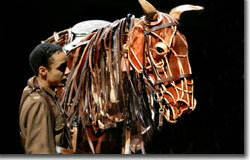 But the real star of the show is Joey—first as a colt, brought to life by Thomas Goodridge, Rachel Leonard, and Mervyn Millar, and then as a stallion, inhabited by Craig Leo, Tommy Luther, and Toby Olié—and his buddy, Topthorn—with detailing by Finn Caldwell, Thomas Goodridge, and Tim Lewis. So incredibly real do these folks make the equines, that the anthropomorphic qualities overwhelm us. Perhaps part of this intangible gestalt can be traced to our species' ancient veneration of the horse as a spiritual and mythological creature; the rest is entirely the extraordinary doings of the Handspring Puppet Company and their astounding talent. 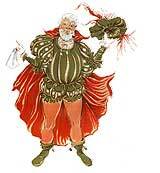 Oh, and did we mention the other four horses, the birds, the goose, the child, and other puppetry personages? We can only hope that the producers are able to bring this show to the states, not only to dazzle us with their technical virtuosity, but to transform us with Joey's and Albert's journeys. 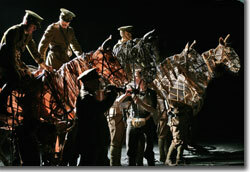 The National Theatre's production of War Horse, based on a novel by Michael Morpurgo, adapted by Nick Stafford, presented in association with Handspring Puppet Company, runs through February 14th. 011-44-020-7452-3000.